Find out just how easy it easy to create a festive Christmas kitchen with just a few simple touches. The kitchen here at Worthing Court is a real workhorse during the holidays! Everything from cooking a meal for twenty, to cooking a meal for two, to holiday baking, to holiday party prep, to holiday crafting – it all takes place in my kitchen. I want my kitchen to be festive and Christmas’y, but I also need room to spread out on my counters and do all that stuff! So, I’ve kept the decor in here very simple – just enough to say Merry Christmas, but still leave me plenty of room to work. My kitchen and breakfast room are one long room, so even though the decorations in the kitchen are simple, the decorations in the breakfast room spread festive Christmas cheer throughout the whole space. One of my favorite areas to decorate is the island. It’s right smack in the middle of the room, so it’s the hub of the kitchen. I always make sure to place something really special and attention drawing there. This is a sponsored post, but I only recommend companies and products I love. Affiliate links are included in this post, I’ll be compensated if someone clicks on an affiliate link and makes a purchase, but there is no additional cost to you. Read my full disclosure policy here. This year I chose to use this awesome two-tiered tray from Emory Valley Mercantile, which is an online shop specializing in farmhouse style decor and accessories. My friend Angie, who blogs at Postcards From The Ridge and is the owner of Emory Valley Mercantile, is offering an exclusive discount to Worthing Court readers! You can shop the entire store by clicking HERE and while you’re shopping, use the code WORTH10 for 10% off of your entire order! The discount code is valid until December 20th. Annnd…..be sure to read all the way to the bottom of this post for an exciting giveaway from Emory Valley Mercantile! Most of the time, I see tiered trays used as part of a hot chocolate station or beverage bar setup. But, I decided to think outside of the box and use mine to display some of my Christmas village pieces. I chose only favorite pieces and then sprinkled some fake snow around after placing all of the pieces where I wanted them to be. If I do need to move it out of the way for anything, it’s easy to just lift up from the bottom or carry by the handle. Tiered trays are sooo super versatile! 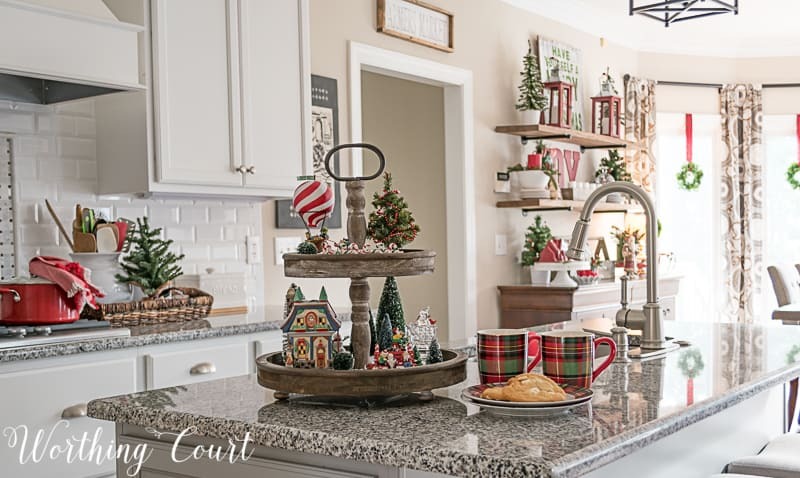 I can imagine one in the kitchen used as a Christmas cookie baking station, a place for displaying candles and greenery, a place to display vintage silverware and serving pieces, a place to display all that Rae Dunn that you’ve been collecting – the list is endless! Emory Valley Mercantile has several shapes and sizes of tiered trays to choose from – you can shop all their tiered trays by clicking HERE. I’m thinking my next purchase will be for the three-tiered rectangular tray! 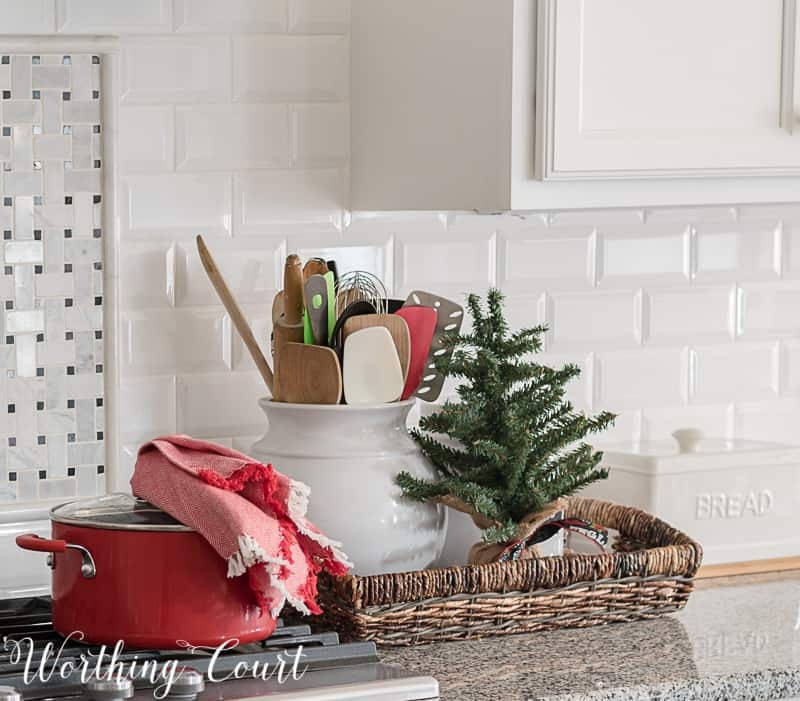 There are lots of little ways to add Christmas decorations to a kitchen without filling it with too much stuff that will get in your way. Take a look around at what you keep out on your counters year round and think about what you could add to it for Christmas. For example these large glass canisters live in my kitchen, in the exact same spot all year long. For Christmas, I tied a sprig of greenery and a cute cookie cutter to the top of each jar. For an added touch, I replaced each scoop with a Christmas plaid mug. 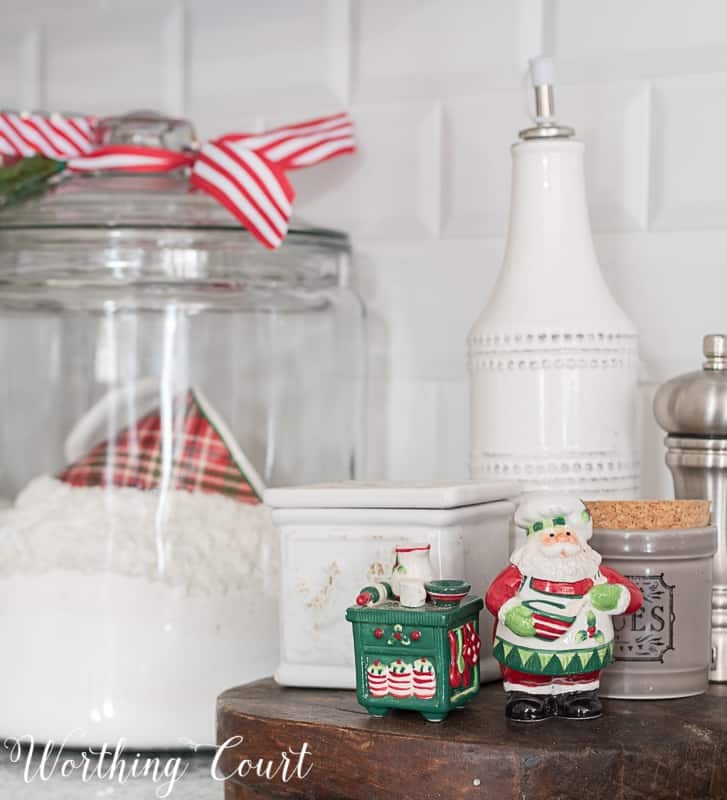 The small tray, beside the cooktop, holds salt and pepper grinders and cellars all year, but for Christmas I added cute Mr. and Mrs. Santa Claus salt and pepper shakers. See? Just little touches. The tray on the opposite side of the cooktop holds the same cooking utensils and dog treat jar all year too. All I did was add a couple of colorful spatulas to the utensil holder and plop a little mini Christmas tree into the basket too. Instant Christmas! To finish off the decorations in my kitchen, I added two Christmas plaid towels to the end of the island. The towels are hanging from small suction cups, so no worries about damaging my cabinet. And, shhhhh – don’t tell – these are actually square napkins instead of actual kitchen towels. Thank you for coming by to visit with me in my Christmas kitchen today. Don’t forget to scroll to the very bottom to enter the giveaway. Merry Christmas y’all! CHECK OUT MY DECORATIONS FROM PREVIOUS YEARS FOR MORE CHRISTMAS KITCHEN DECORATING IDEAS. ENTER TO WIN A $50 GIFT CARD FROM EMORY VALLEY MERCANTILE! So festive and very tasteful! 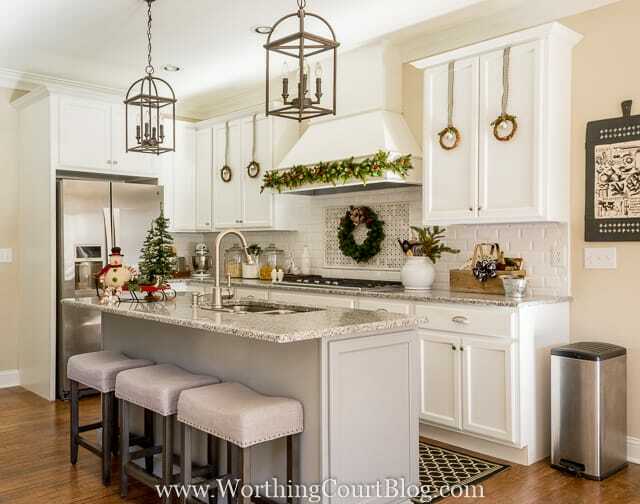 Want a beautiful Christmas kitchen…….Love it!!! Looks great! Love the gray too! 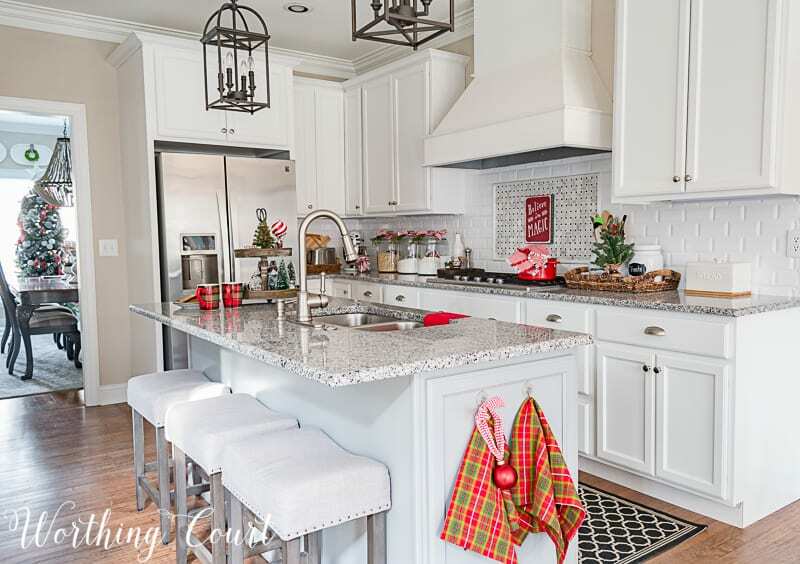 Very festive and bright Christmas decor and great kitchen! you are certainly ready for the holidays suzy! beautiful as always! I am so in love with your Christmas house! So festive! 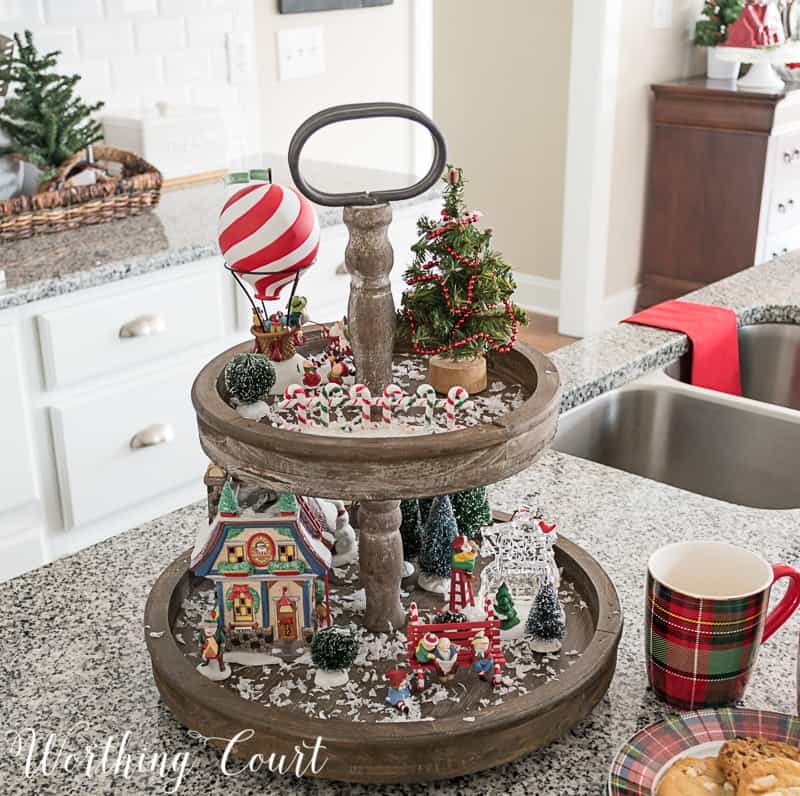 I love the tiered tray And all of your Christmas decor! I love all the small touches in your kitchen! Love, Love, Love the 2 tiered tray. Will have fun browsing and shopping at Emory Valley Mercantile! I love how it looks. Clean and bright and tasteful touches of Christmas. Just the right amount without being overwhelming!! Have a wonderful weekend. Love your Christmas kitchen. I like your suggestions to add a bit of Christmas to your everyday items! Perfect decor for a cheerful working kitchen! The tiered tray is fabulous! Beautiful kitchen…so full of color and cheer. So pretty and festive! I love the canister idea – adorable! Enjoy your weekend! We are remodeling our kitchen now and because of that our whole house is turned upside down with kitchen boxes in every room! Makes me appreciate what my home means to me and how its organization normally keeps me sane. Love the touches of red! 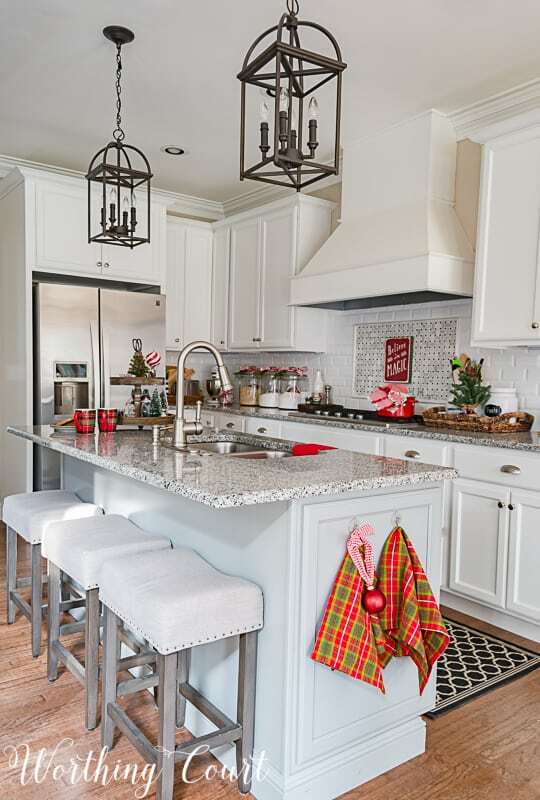 Love the touches of red and Christmas in your kitchen. I love tiered trays. I have several in my house. I checked out the Emory Valley Mercantile and there are so many things I’d love to have. Everything looks so festive, Suzy! 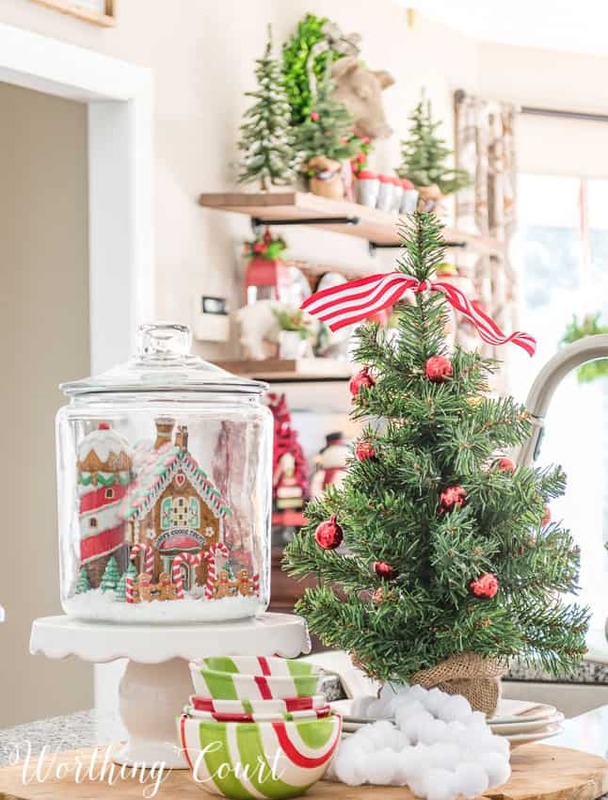 I love the cookie jar cloche with the gingerbread house, and your plaid dinnerware. The tiered tray looks lovely. You get an A+! I love the way you decorated your kitchen. Thanks for the ideas and a new place for me to shop. Love your kitchen every year! Using your Christmas mugs for scoops idea! All very festive! 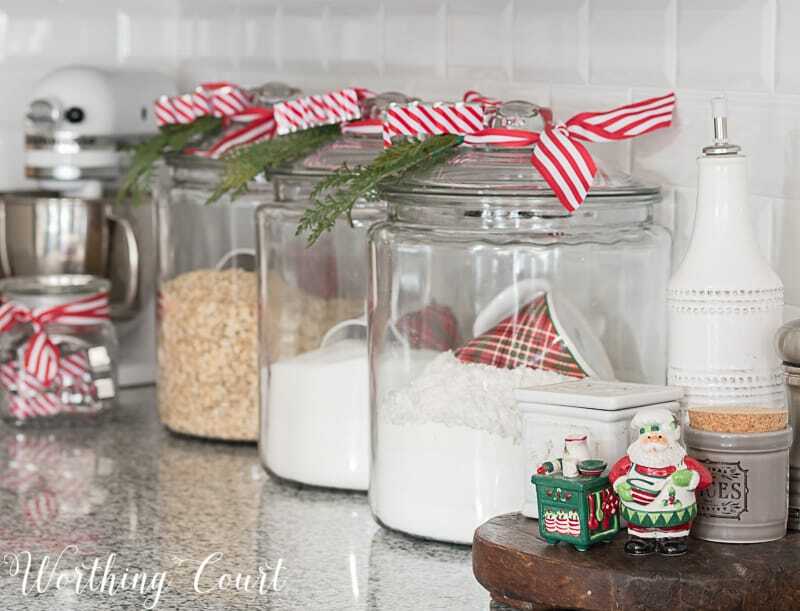 Love the mugs in the big jars and the bows and greenery are just the right touch. Thanks for the inspiration. Love the two tiered tray!! How you decorated it as a Christmas village is so cute!! Thanks for these great ideas!! Thanks for the giveaway! Love that your kitchen is decorated with use in mind. Merry Christmas. 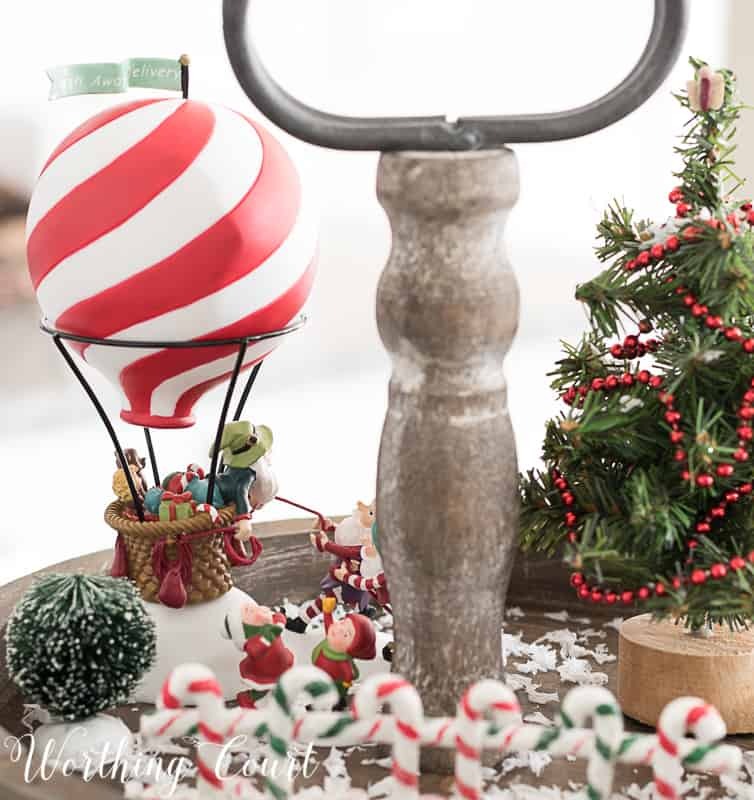 I love that all of these ideas are so simple yet add such a gorgeous festive vibe! I love how you used the tieredvtray to display pieces of your Christmas village. Your kitchen is very pretty and festive. How cute! I like all the little trees you have. Your kitchen is lovely, MERRY CHRISTMAS! I love your creative mind! It inspires me. Your kitchen is so fun and festive. I need to work on mine now! Thanks for sharing. My kitchen is also very busy during the holidays, but want to spread a little Christmas decor too. Thanks for sharing. My kitchen is also so busy during the holidays, but want a little bit of Christmas decor. Looks great Suzy! Thanks for the chance to win! Beautiful kitchen – am in love with that tray and your little village pieces make it so perfect! I just love looking at your photos. I get so many decorating ideas. So elegantly done. I would prefer a 2-tiered if I had one as there is not much space between my counter and the upper cabinets. Love how you decorated it. Where did you purchase your little white pig you put the wreath on? I have gotten the inspiration from you to tie bows!!! Hi Kay. Isn’t he cute? I got him from a local home decor shop last year. I believe the brand is Raz if you want to try to look for one. Love all your Christmas ideas! Your Christmas kitchen turned out lovely. Of course everything you touch always does. Very bright, inviting and cheery. I look forward to your daily blogs and wonderful decorating ideas. Love the tiered tray with your little favorites…so darn cute Suzy! Love how you decorated the tiered tray. Always get so much inspiration from your blog. I love your decorating style; your kitchen is so inviting and festive. Just right with all the little touches popping up now and then! I love it!!!. So fun and cheerful. I love how you have little touches of Christmas all around your kitchen! What I cute idea to use the Christmas plaid mugs in your canisters! I also love how you decorated the two tiered tray! I always love to see what you have come up with in your kitchen. Love all your decorating ideas. Thank you for sharing. I love the little touches that make your kitchen festive and still leave room to cook! Your kitchen looks great! Not only is it festive. It is relaxing to the eye and not over decorated. Love all what you have done! Hi suzy, I love the way you use trays to have your vignette’s, easy to move if you need extra space for chopping and mixing! Your way ahead of me this year. This is so festive but with a clean slate as well! Your whole home is very pretty! Beautiful Christmas kitchen! Love all of the colors! Tiered trays are so versatile. Love that you can use them no matter what the season just by changing out what’s displayed. So festive and cute! I love the tiered tray! What a beautiful Christmas kitchen!! Your Santa sitting reading a newspaper is darling. Your kitchen looks perfectly lovely. 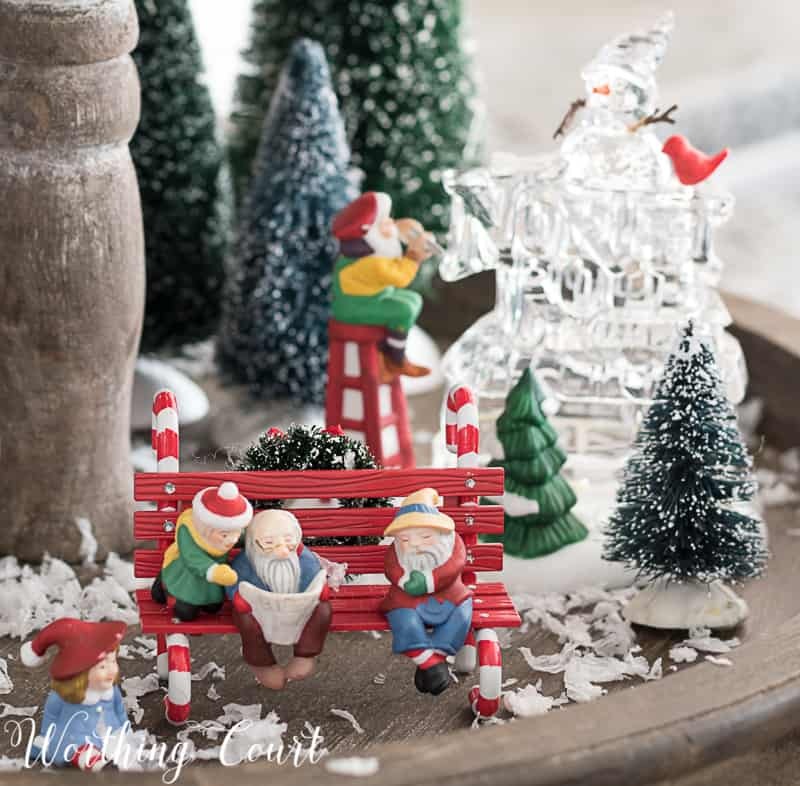 I love the tiered tray and I recognize your Christmas village pieces. I have that village and just adore it. each piece was is so detailed. Love the small touches of Christmas! Looking forward to shopping at Emory Valley Merchantile! Thanks for sharing! the “Merry Christmas ya’ll” towel is GREAT! 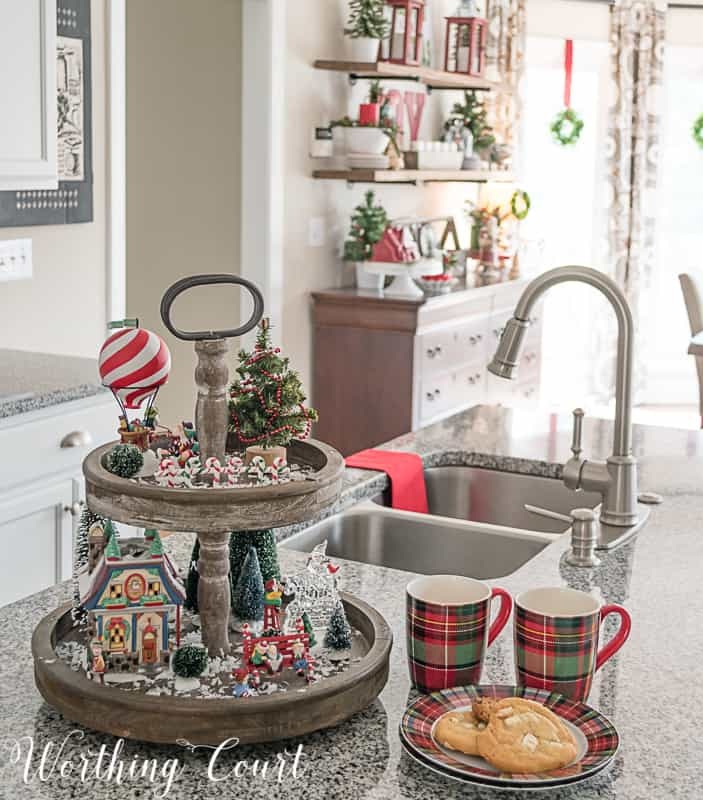 Your kitchen looks so festive 🙂 The two-tiered tray would be great for holiday entertaining…..I love it!!!! Love your blog. You have just the right amount of Christmas in your kitchen…you give me some good ideas. Your Christmas kitchen decor is so cute. Thanks for sharing. Wishing you much merriness as you celebrate with your family this season! God bless everyone! I am totally in love with the tiered tray and love the decorations. Love all your decorating ideas!!! Your home look very festive and beautiful with all the touches of Christmas throughout!! You are such a generous blogger! Thanks for one more opportunity to make our homes special. Just a little made a big impact! So cute and festive! What a beautiful and festive kitchen. I love the 2 tier wood tray. Loving your blog! 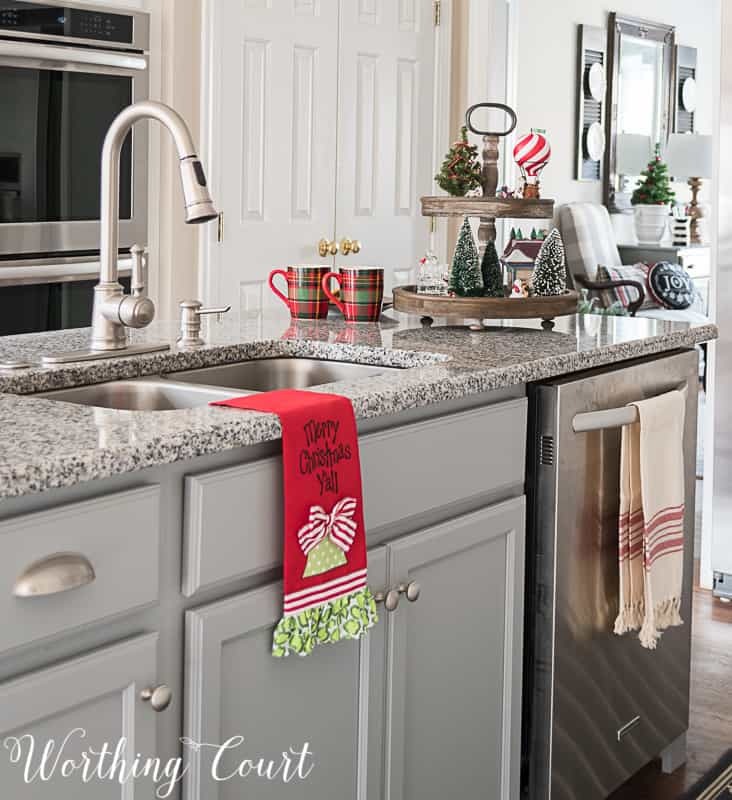 Great ideas on how to dress year-round countertop items for the holidays. Your kitchen is so pretty! I just love it! I love how you decorated your kitchen for Christmas! It looks so lovely! What a beautiful kitchen and decor!!! I love how you added little touches of Christmas to your kitchen. I really love how you decorated the tiered tray, beautiful! Such great ideas! I do the same by adding a holiday touch to everyday kitchen items. Yours look fantastic…..as always! The small touches here and there make a big difference. I like your ideas. Love your decorations, thanks for the tips. 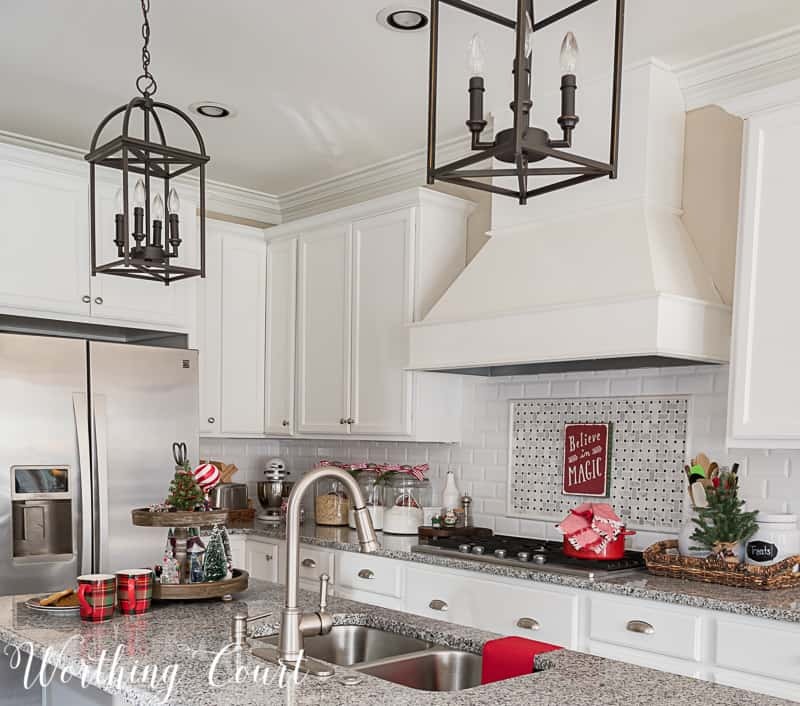 You created a really beautiful, festive holiday kitchen Suzy, love it! Your little touches are beautiful! Beautiful! I love your Christmas house! Yours is my favorite in all of blogland!! You’ve done a great job. Your kitchen looks beautiful. I really, really love the little houses in the jar. Emory Valley Mercantile is new to me, but I enjoyed poking around the website to see what they offer. Love your tray…and your festive decor! Such a lovely kitchen! I really love all the Christmas decor. Always so beautiful! Thank you for sharing. Very beautiful, love the tiered tray idea. Happy Holidays! I love the plaid coffee mugs and plates! I like the selection on their site, especially the Wire Wall Basket. I just looked at their site and I saw so many beautiful things. I love these items, they’re so cute. EVERYTHING IS SO FESTIVE!!!! So Stunning !!!! Just beautiful! My fav is def the canisters. A simple mug makes your sugar bowl look so festive! I loved the two tier tray! The way you had it fixed reminds me of a Christmas fairy garden !